Educators are invited to facilitate values activities to engage students in exploring and choosing their own personal values while developing intrapersonal and interpersonal skills to “live” those values. 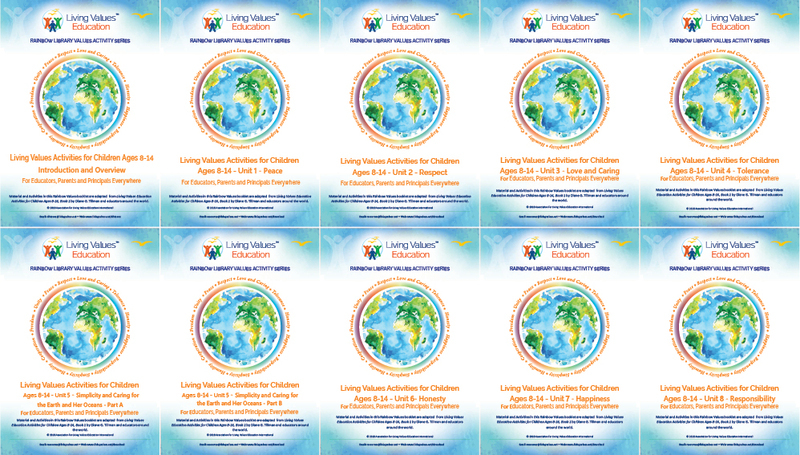 The updated and expanded Living Values Education Activities books offer a wide variety of activities to help young people build self-respect, critical thinking and emotional intelligence and co-create a culture of peace, caring and respect with their teachers and peers. Living Values Education Activities for Children Ages 8–14, Book 1 and 2 contain goals and objectives, scripted values lessons and stories. Values are explained both in simple and abstract ways. Age-appropriate lessons include imagining exercises, reflection points, mind-mapping, discussion, role playing, relaxation/focusing exercises, movement and songs. Positive self-talk, conflict resolution skills, cooperative behaviour and developing green values are part of the focus. Learners are nurtured in making values their own through artistic activities, creative writing and skits. Given the increasing negative influences young people are exposed and subjected to, these updated and expanded books also include activities to help young people understand influences and consequences, stay safe and increase their motivation and capacity to be a positive force for the good. A few of the areas addressed are dealing with bullying in assertive and proactive ways, reflecting on and creating their own guidelines for involvement in social media, learning how to encourage themselves in positive ways and manage their emotions, be safe from being entrapped, and develop a voice and positive social skills to create inclusion, kindness, fairness and respect. The eight values units in Living Values Education Activities for Children Ages 8–14, Book 1 are Peace I, Respect I, Love and Caring, Tolerance, Honesty, Happiness, Responsibility, and Simplicity and Caring for our Earth and Her Oceans. It is designed to be used in the first year of implementing the Living Values Education Approach and in alternate years. 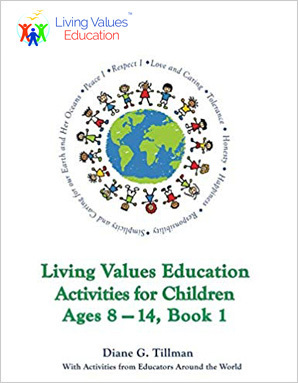 The eight values units in Living Values Education Activities for Children Ages 8–14, Book 2 are Peace II, Respect II, Cooperation, Compassion, Humility, Another Value We Love, Freedom and Unity. It is designed to be used in the second year of implementation and in subsequent alternate years. The sixteen values units in the two updated and expanded Living Values Education Activities books include other related values such as kindness, fairness, determination, integrity, appreciation, diversity, gratitude, inclusion and social justice. Amazon: Search for Items Eligible for International Shipping - Most items can be shipped to over 100 countries outside the U.S.
As we want everyone to be able to use the Updated and Expanded Living Values Education Activities for Children Ages 8–14, Book 1, we are making the introductory chapters and the values units available free of charge in small booklets.